Spoilers for Barry Allen and Nora West-Allen ahead, if you haven’t caught on season four, you may want to stop reading. As a refreshing change for it’s season ender. CW‘s The Flash has a more optimistic ending, well, at least for Barry Allen and Iris West. With the arrival of Nora West-Allen and how it seems she’s almost doing the same thing as Barry did with messing with the timeline and all that. But it seems things are going to be interesting with the dynamics between Barry since he suddenly became a father to another speedster. So here’s a few interview tidbits from the San Diego Comic Con 2018 of Grant Gustin last July. Q: Does Barry immediately accept the fact that Nora is his daughter from the future? At first, I think there’s some kind of skepticism and apprehension because we’ve been lied to by people that have walked into the Cortex before. They’ve had people say they were somebody, but then they turned out to be somebody else, so Barry doesn’t want to fall for anything like that again. I think we’ve seen Barry mature a lot over the past few years. When I was cast, I was 23 years old. I’ll turn 29 this season. I’ve grown up a lot on the show and Barry has, too. I think Barry and I function off our gut. We both know it’s our daughter. We both believe that it’s her, but she gives off a different vibe to each parent. 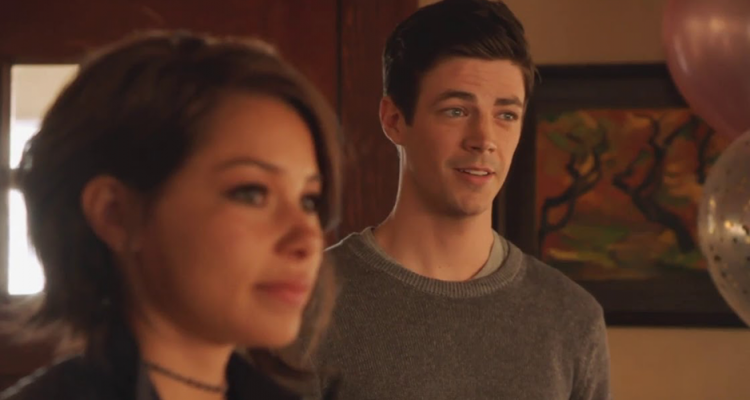 Q: In the season four finale, Nora [played by Jessica Parker Kennedy] revealed she was the daughter of Barry and Iris [played by Candice Patton]. How does the couple react to their new family member in season five? Q: Why didn’t Barry teach his daughter about the danger of messing with the timeline? Q: Barry has suddenly become a father and he has to acclimate to this very bizarre situation where he has a daughter in her twenties. How does that change his story? It’s hard for Barry because he’s always wanted a family. He’s always wanted a kid. Getting Nora is strange in a way because he almost feels like he’s had something else stolen from him. His life; none of it is normal. His mom was killed because of these powers. He grew up with his dad in prison because of these powers. And now he doesn’t even get to meet his daughter in the normal way. He meets her when she’s in her mid-twenties and he thinks, ‘Wait… Are we going to miss out on hearing her heartbeat on the sonogram? Are we going to miss out on seeing her first smile?’ What does this take away from him? Well, we’ll see him deal with it in stages. At first, it’s a tough, weird situation for him because he does feel like he’s been robbed of a lot. He knows this is a gift – but at the same time, how will this affect the future? Q: Is Barry worried he might erase Nora from history somehow? So what do you guys think of their relationship and how it will unfold in the fifth season?